Are you looking for a protein snack? 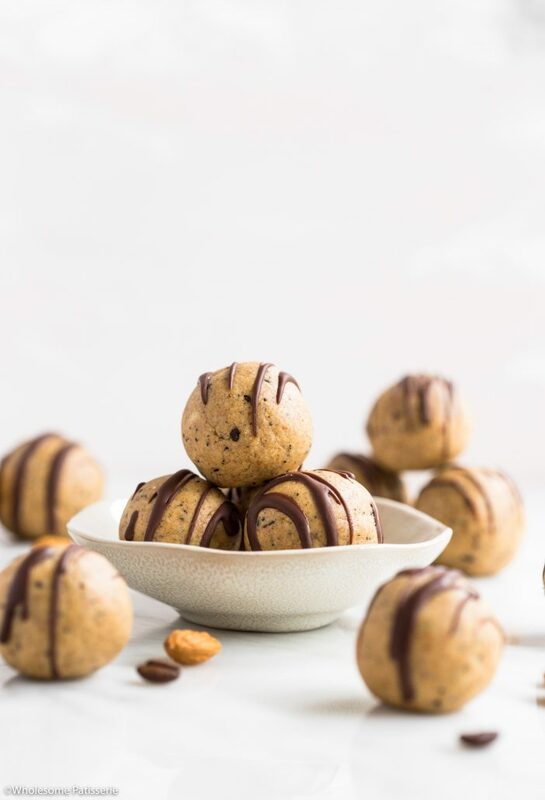 Because I just created these protein bliss balls on the weekend and I’m ready to tell you all about it! 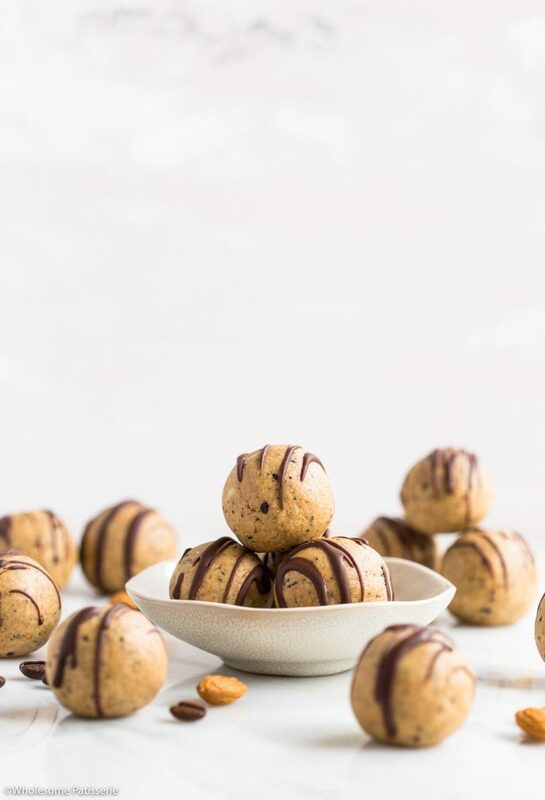 5-ingredients in the balls themselves (6 if you count the drizzled chocolate), 1 food processor and that’s all you need to make your own batch of these bad boys! Their flavour? Vanilla – or whatever flavour your protein powder on hand is! So I just started some at home fitness training because you won’t find me inside gym just yet, I would have trouble navigating myself to the front desk! Haha. Because I have started exercising these days, you naturally get curious about everything that goes with it, protein being one of them. I found a great whey protein concentrate powder (I use Bulk Nutrients, if you’re at all curious) and decided it was about time I actually created a protein powder recipe. I was never drawn to protein powder snacks because I never had a use for them, but now I certainly do! 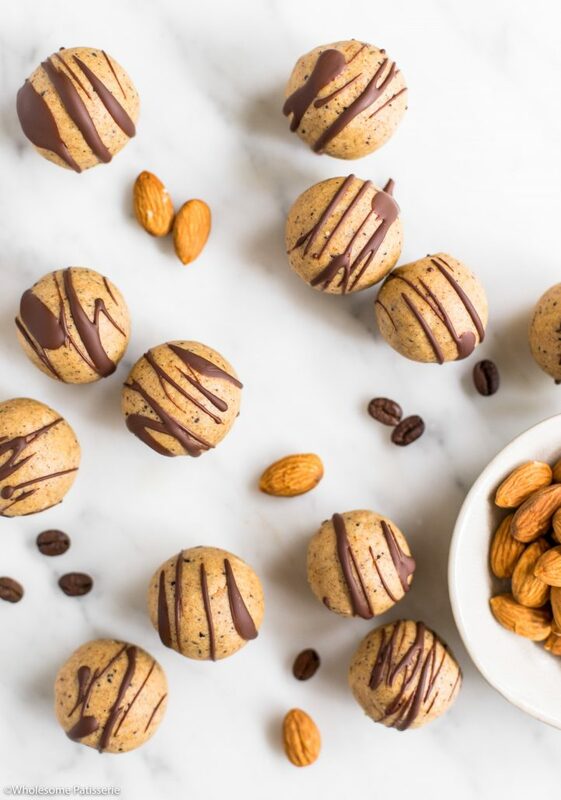 Protein snacks are just another great way to get your protein fix during the day, besides your protein shakes. Bliss balls were an obvious choice for my first protein powder recipe and so I rolled with it, no pun intended. 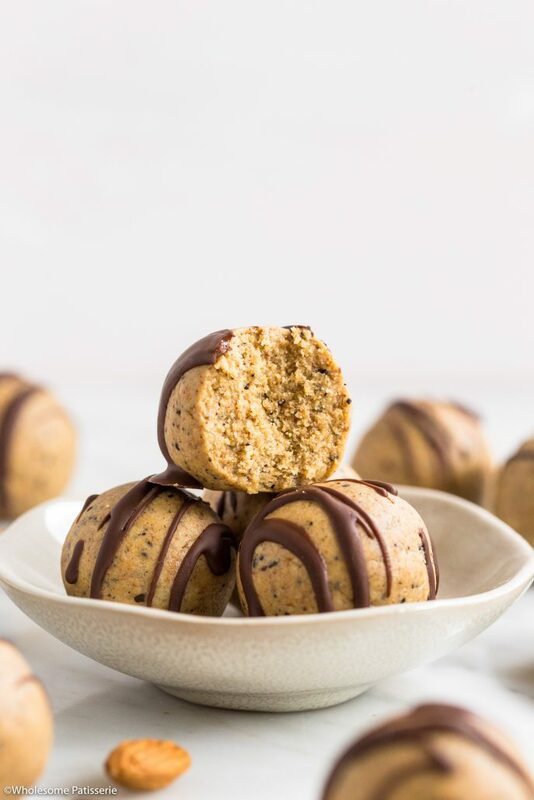 Making recipes quick, easy and still delicious is now my focus and these bliss balls are no exception! 5-ingredients is all you need, the chocolate drizzle is completely optional but add it, it’s the best 😉 so let’s make that 6-ingredients. All blended up in your food processor. I use vanilla flavoured protein powder but don’t think that you have to go out and purchase vanilla protein powder if you don’t have it on hand. If you have another flavour such as chocolate, you can use that too, yum chocolate…. I decided to add a hint of ground up coffee beans into the mixture because why not? If you want to use these as your pre-workout fuel, coffee is a wonderful addition for that very purpose. Also on the topic of pre-workout snack, these bliss balls will be great! Not too big and not too small, pre-workout protein snack, sorted! Enjoy! Line a small tray with parchment paper and aside. In a high-speed food processor, add all ingredients except the chocolate. Blend on high until well combined and mixture sticks together, resembling a soft dough. Add a little more maple syrup if it’s too dry. Pick up approx. 1-2 tablespoons of mixture and roll into balls. Place on lined tray. NOTE: if you’re not drizzling over the chocolate, place the glass straight into a container. Drizzle melted chocolate over the bliss balls. Place in the refrigerator for 15-20 minutes or until chocolate has set. Store in an airtight container, refrigerated, for 1 week - 10 days.